An article is a specialized way to present content within HotDoodle. Articles are presented as a list including a title, the body text, and even a picture. 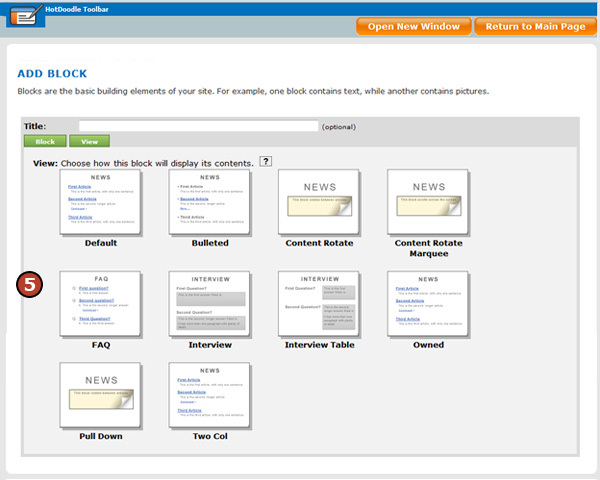 The article block includes several options for customizing the formatting and behavior of articles. Articles can be used for a variety of purposes including whitepapers, news stories, and testimonials. 4. Click on the "Articles Block" button. 5. Click on the view button for the block view you would like to select. 6. Click on the "Insert this block" button. 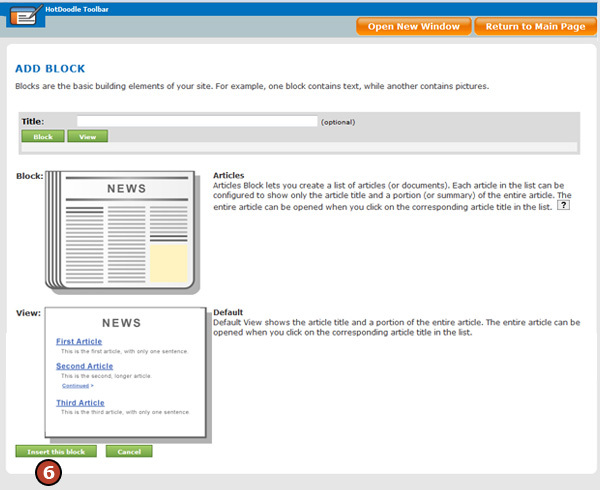 The configure Articles Block window appears. 7. 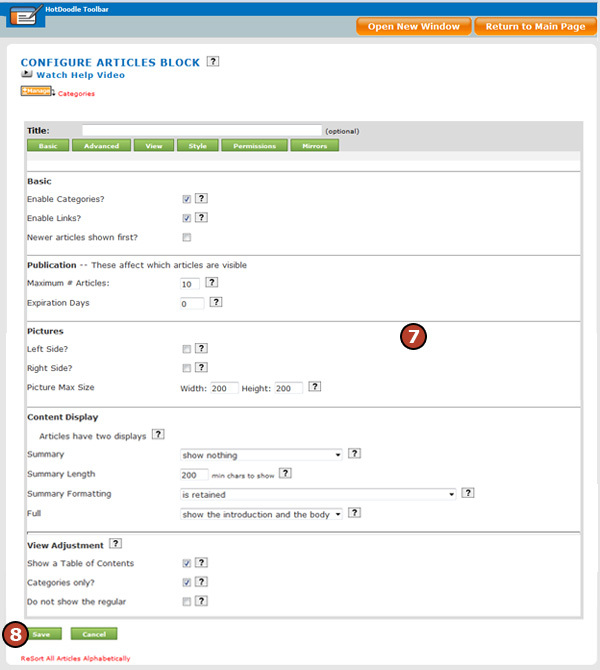 Select the settings for the Articles Block. Basic – The basic settings enable or disable the use of categories and hyperlinks, and determine whether newer or older articles are shown first. Publication – The publication settings set the maximum number of articles displayed at one time and whether or not articles expire. Pictures – The picture settings determine the display of images on the right or left of the text, and set a maximum size for images. Content Display – The content display settings specify how the preview of an article is shown within the list of articles. See Content Display Options for details about each option. View Adjustment – The view adjustment settings determine if a table of contents is shown with the articles or alone, and if the table of contents lists categories. Optional: Click the "Resort All Articles Alphabetically" link to list the articles alphabetically. Default - This view displays a single list of articles. Each article is shown with the title, portion of the body text, and an image if specified. Bulleted - This view displays a bulleted list of articles, where the bullet appears next to each article title. Each article is shown with the title, portion of the body text, and an image if specified. Article can also be configured to pop up when the cursor hovers over the title. Content Rotate - This view displays only one article title and summary at random from a group of articles. The article rotates to a new article each time the page is visited. Content Rotate Marquee - This view displays the article summary scrolling across the screen like a marquee sign. The article rotates to a new scrolling article each time the page is visited. FAQ - This view is similiar to the Default view, but it automatically replaces the article title and summary with a Question and Answer format, where the title is the question and the summary is the answer. This view can be used for an entire Frequently Asked Questions page. Interview - This view allows users with permissions to provide requested information. The title specifies the requested information, and the summary is where the requested information is entered. This view can be used to create member profiles. Interview Table - This view is similiar to the Interview view, but adds a two column format for a question and answer table. Owned - This view filters the articles and only shows the articles owned by the user. 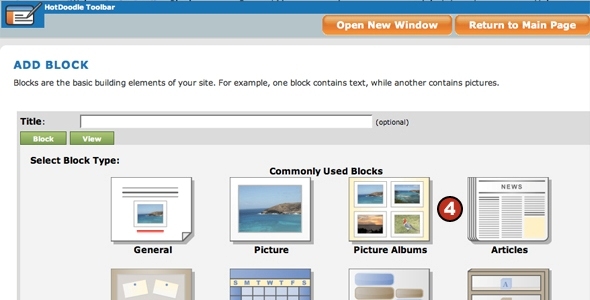 This view can be used in member private pages to show the profile of only that member, while mirrors of this block can use different views to show all profiles in another location. Pull Down - This view shows the titles of articles in a group as choices in a pull down. When a title is selected from the drop down, that article is displayed. The summary and formatting options are not used in this view. Two Column - This view is for use with categories where the categories are listed in the first column, and the articles related to those categories are shown in the second column. Summary Options - The summary is the text that displays on the main page that the article appears. The summary can be configured to be only and introduction with a "continued" link to view more, can display the whole article, or can show nothing. Show introduction only - This option displays the introduction of the article with a "Continued" link to the full article. 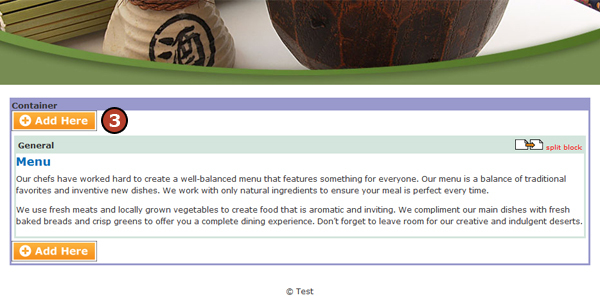 Show the introduction and the body - This option displays all body text on the main page. Show nothing - This option displays no body text on the main page. This option is used for just a list of article titles that link to the full articles. Summary Length - This option lets you determine the number of characters to display in the summary on the main page. The summary will automatically cut off after the first line break or if the following code is inserted "==break==" in the body of the text. This code will only be visible when editing an article individually and will never be displayed on the web page. Summary Formatting - the formating of text can be removed from the summary on the main page, but retained when the article is opened. Is stripped except for links - This option removes all formating except it retains clickable links. Is retained - This options displays all formatting in the summary on the main page. Advanced formatting is stripped but links, pics, and bold are retained - This option removes formatting, but retains clickable links, any pictures, and any text that is bold. Full - This option configures how the article will display when viewed in full. Show the introduction and the body - This option displays the introduction and the body when the full article is viewed. Show the body only - This option displays only the body when the article is viewed in full.